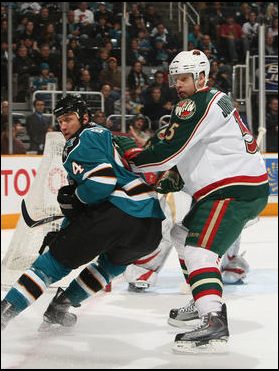 Quite the special game for both teams, but the Sharks were too much for the Minnesota Wild and won 5-2. Special was the name of the game, as in special teams. Out of the seven goals, six were from the man advantage. Poor nsblues/BHD won’t be too happy about this one. Whenever a team goes 4-for-7 on the power play, chances are the end result will be a win. That’s what the Sharks did. For at least one night, no one can mention how bad the power play is at home. It was stellar. 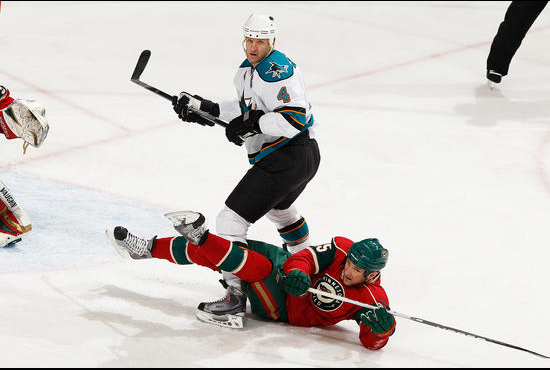 Jason Demers was the quarterback, replacing the still-injured Dan Boyle, and did a marvelous job. He scored two goals on his only two shots. Demers amassed 21:48 of ice time, playing in all three situations — even strength, power play and penalty kill. This kid will be something special. Boyle was his favorite player and inspiration to be an offensive defenseman. I can’t imagine how cool it is to end up playing with your favorite player and learn from him. Now Demers just needs some defensive improvement to become that all-around defenseman players can count on. Back to the game: the Wild scored first showing the Sharks they were here to play. After Demers’ first tally, the Wild struck again right at the end of the first period to make it 2-1. Perhaps the hangover from the Chicago loss was getting to them, but that was cured during intermission. Goalie Evgeni Nabokov stepped his game up tremendously and made key save after key save. I was reading Sharks beat writer David Pollak’s blog earlier, and a few people were questioning why Nabokov keeps starting. Well, my little grasshoppers, if you had followed the Sharks intently at all, you would know coach Todd McLellan is doing this to prevent what happened last year. McLellan gave Nabby much more rest and it didn’t work at all. This time around, he’s letting Nabby keep playing. McLellan has stated this a couple times. I don’t see fatigue being much a factor anyway with goalies. They may be on the ice all 60 minutes, but how much are they really playing? An offensive forecheck for 30 seconds where Nabby has to watch the puck. Make one save and the puck is going the other way. He isn’t exerting that much energy during games, at least not continuously. People are looking into this way too much. Anyway, Demers’ second goal followed by Joe Pavelski’s wicked wrister put the Sharks on top for good. Pavs’ wrister makes even the toughest men become screaming, little girls. Speaking of little girls, Joe Thornton continued his horrendous play tonight with seven giveaways. At some point, McLellan must address this — whether reduced ice time or a complete line demotion. Thornton just isn’t trying. I think the Sharks would be better off strapping skates on a two-by-four. Patrick Marleau finished things off with two goals in the third (one may or may not be credited to Dany Heatley). I wonder when serious contract talks start or if they already have. Patty is San Jose. Sign him for the rest of his life. Just, please, keep the “C” far, far away. Hit-O-Meter: SJ 21 MIN 18; Scott Nichol led with eight. Detroit meanders their way into town on Tuesday. Godspeed. Quite the turnaround performance from the Sharks tonight as they took care of the Minnesota Wild, 4-2. Things looked bleak for San Jose early, and I was worried we wouldn’t be able to string two wins in a row. Throughout the first period, the Sharks looked sluggish and uninterested in playing tonight. The Wild dominated the neutral zone and had the 1-0 lead going into the second period. The light switched flipped on (as did the refs whistles), and the Sharks scored three in the second. Early on in the second stanza, San Jose kept taking penalties — at one point killing off a 5 on 3 until a Wild player took a penalty. There were 16 minutes of penalties in the second period (10 on SJ, 6 on MIN). The Wild took a 2-0 lead on a fluke deflection off Dan Boyle’s skate. The puck flew over goalie Evgeni Nabokov’s head and into the net. After that play, the Sharks started swimming. I was thinking it would be a good time for a fight, being down 2-0 and not looking good. Jody Shelley came on the ice, and his line gave a strong forecheck that led to Jed Ortmeyer’s first goal as a Shark. Congratulations to Jed. Patrick Marleau, with some newfound, rocket-skates, hit a slapshot off Wild goalie Niklas Backstrom. A nice rebound lay on the ice, and Patty flipped it over Backstrom and in for a goal. The penalties started to catch up with the Wild, though. The Sharks power play got on the board when Dany Heatley fired a one-timer cannon into the net — his accuracy is unbelievable. Much to the Wild’s shock, the third period opened with another Marleau goal — just nine seconds in. 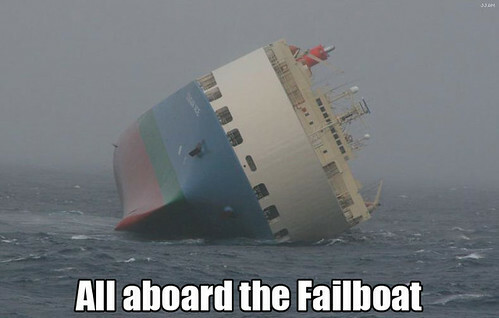 Seriously, Patty should have lost his captaincy a long time ago if we’d known he would play like this. He might challenge Heater for most goals. One of the most important aspects of this game was Nabby’s goaltending. It was outstanding. Absolutely phenomenal — his best game of the season. After the two goals, he stoned everyone — and these just weren’t weak shots from the point. These were point-blank opportunities with a plethora of juicy rebounds. I honestly have no clue how nothing went in. Well, that’s not true. Every player on the Sharks was giving 110% effort, no question. Ryane Clowe, in particular, dove to prevent a wide-open net. Marc-Edouard Vlasic dove to block pucks; Jason Demers was diving to prevent shots; Benn Ferriero consistently skated hard to the net. It was spectacular to see such effort from the Sharks. Jamie McGinn stayed in the lineup tonight, even after Brad Staubitz served his suspension last game. McGinn made a bonecrushing hit on a Wild player behind Backstrom. Good to see him giving his all as well. This is the second time the Sharks scored four straight goals in the young season. That shows how potent this offense is when it’s on. I hope they take note and recognize they have even more potential. I hope Nabby takes this game’s performance, sticks it in a bottle, and unleashes it every game. This is the Nabby we remember; this is the Nabby that we love. Let this not be a Douglas-Murray-hat-trick type of once-in-a-lifetime deal. Devin Setoguchi racked up five hits, which led the team — nice to see Gooch doing something different/more than what he’s asked. Rob Blake blocked five shots, which led the team — nice to see Blakey doing something he’s supposed to do, and excelling at it. The Sharks play Phoenix, Monday. It’s their last home game before taking off on a six-game east coast road trip. It’s crucial to win this game and not sleep on the Coyotes. Phoenix always plays the Sharks hard, so getting the effort going shouldn’t be a problem. But if I’ve seen anything this season so far, it’s the Sharks like to play the Dr. Jekyll/Mr. Hyde card. Please don’t.